comfortably or succeed incredibly – and learn. As stewards of resourcefulness, collaboration, ingenuity and innovation. 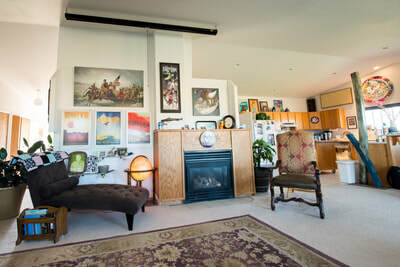 The Blunderbuss Project House hosts 6 bedrooms and 13 project spaces that are rented out to people who are residents or come in daily.The house includes maker spaces, art gallery, studios, co-working space, fire pit, ultimate lounge, conference room, 4 hole disc golf course and a garden. Blunderbuss is committed to making multi-generational education, open community dialogue and unhindered creativity of foremost priority. A community resource for mind bending.